The Fellowship was fortunate enough to obtain a copy of CAPTAIN KRONOS – VAMPIRE HUNTER #1 from Titan Comics and Hammer Comics. Dan Abnett writes, Tom Mandrake draws, Sian Mandrake colors, and Simon Bowland letters. Kronos is a soldier returned from duty, and he has sworn himself to the destruction of all vampires. But the monsters are many, and as one falls to his blade, another presents itself. The next one is in Serechurch, and calls itself Slake. It controls most of the township, but Kronos and his companions waste little time in announcing their intentions. This title is a continuation of the Hammer film, and this first issue is a good start to capturing the essence of the film. Kronos is unlikely to ever run out of monsters to kill, which creates the potential for a long-term story here. And the art and colors are amazing, channeling the great comics of the 1970s to delightful effect. I admit to being a fan of Hammer films, and the vampire films in particular. And this book brings back Captain Kronos in an exciting and atmospheric way. I’m really looking forward to the rest of this series. 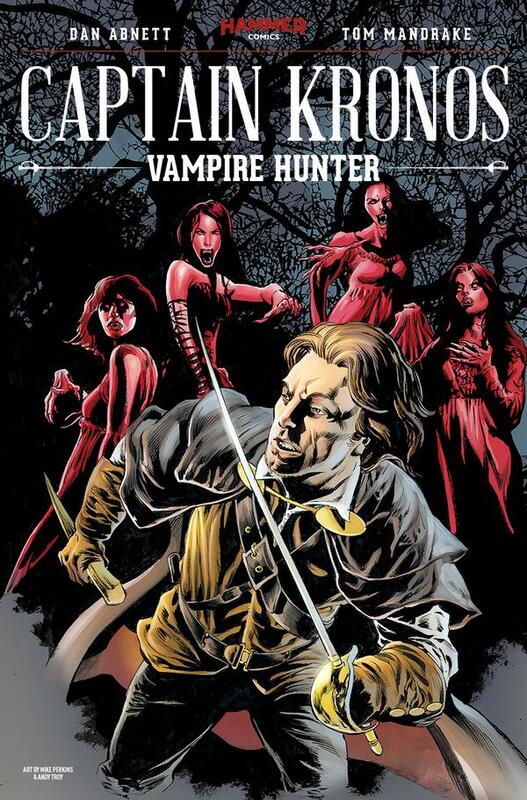 CAPTAIN KRONOS – VAMPIRE HUNTER #1 is available now from your local comic shop, or online at titan-studios.com.